Thanks to Gary (he was sick so the concert was postponed to Sep), or I’d have no concerts to go to for 3 months. 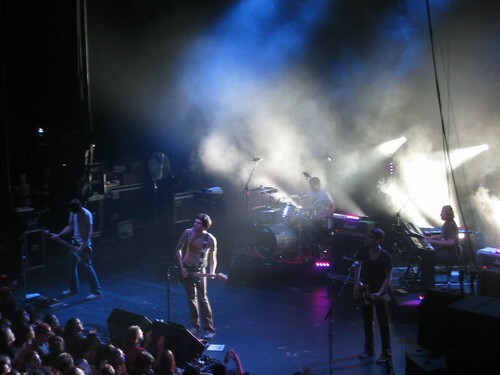 This is my second Snow Patrol concert and it was still great. 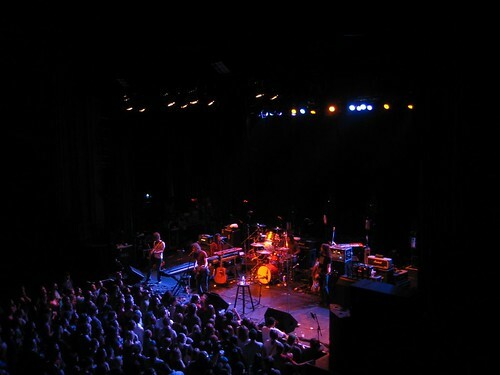 Augustana opened for them. We saw Augustana at Alice’s Now & Zen concert but we missed most of their songs due to the traffic and parking. This time we got to listen to their other songs. (All they play on the radio is Boston.) It was good but not spetacular, and Dan was so nervous!! But something fun happened during their performance. Before they sang the second song, Dan said “It’s Chris’ birthday! He is 24 today!” and the audience started to sing Happy Birthday. I was so great! kinda touching. But then Chris said shyly that it’s not really his birthday but thanked Dan for remembering him having a birthday. @_@ After the song, Dan confessed that it wasn’t really Chris’ birthday. He’s just nervous and didn’t know what to say. XD But Chris’ birthday was actually pretty close so I think it’s okay. Then it’s Snow Patrol. I still love Nathan the most. Btw, their heads are so 60s.